I am a tofu lover.. Its health benefits are numerous, and the ways you can prepare it are innumerable. 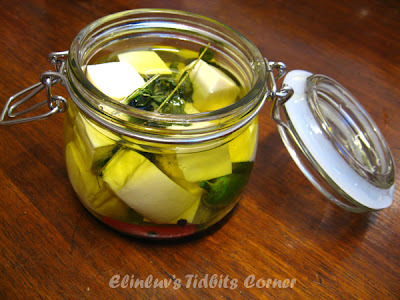 I have even tried making my own homemade egg tofu :) but I have never tried making pickled tofu ! I am curious how it would taste like after being pickled with herbs infused olive oil for a week at room temperature. This recipe was taken from the Flavour Magazine the February, 2011 issue. Yea, this magazine is a year old :p and it is only now that I started trying out the recipes from the book. I have bookmarked this recipe a year ago but only got around to try it recently. Tofu is so versatile that you can make anything out of them :) You can eat this pickled tofu as a stand alone or as topping for bruschetta or as a condiment side dish for your meat or fish dishes. The magazine suggests topping for your bruschetta but I served them as a side dish/condiment for porridge ...trust me it was good and I will be making this again. lemongrass, curry leaves, basil leaves, chilli pepper. Scald the tofu in boiling water for 2-3 minutes. Drain on paper towels and place in a pot. 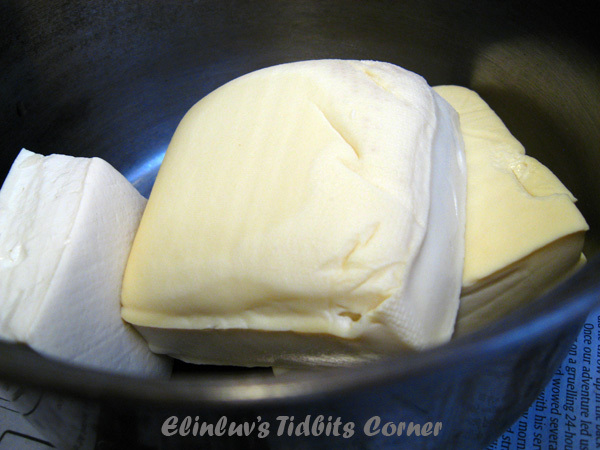 Cover the pot with a lid and leave overnight at room temperature to ferment. 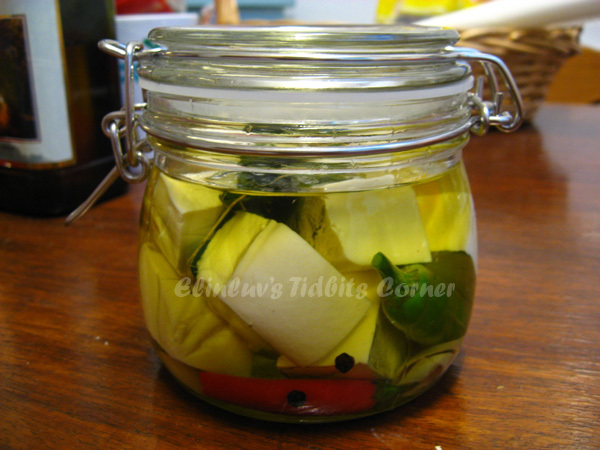 Transfer to a glass jar, and add the capsicum, lemongrass, curry leaves, peppercorns and basil. 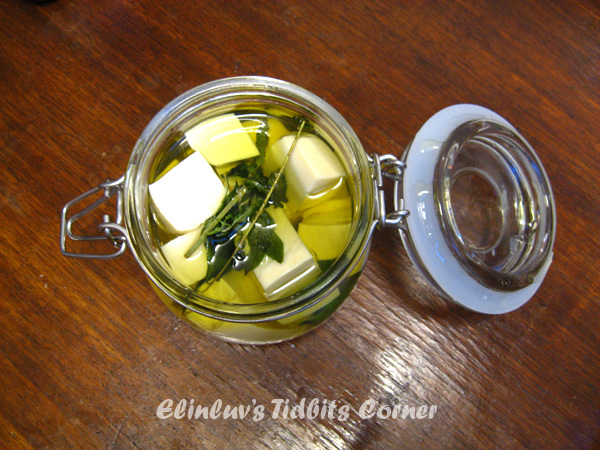 Mix the olive oil with salt, then pour over the tofu in the jar and cover. 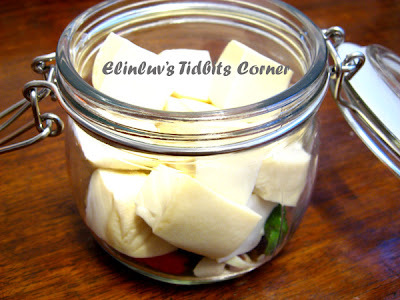 Allow the tofu to stand at room temperature for about 1 week, in the covered jar. Shake the jar occassionally. The tofu will be soft and creamy once it's ready. Thank you so much for the award! You receiving it was well deserved. Gosh, this is tofu with a difference. I've never seen it done this way before. It sounds deliciously fragrant. Hey, thanks so very much for the award. I have it displayed proudly on my side bar :) You definitely deserve it as well ... definitely very versatile! I love tofu too and eat it in all forms, Have not tried stinky tofu though. 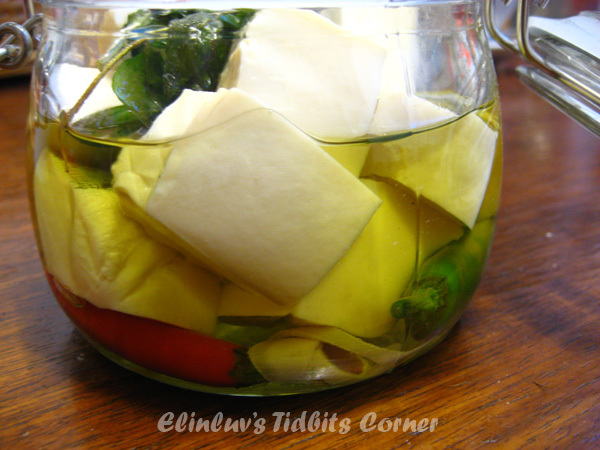 I can imagine this pickled tofu must be really tasty with all those herbs and spices. Congrats on your award. Very well deserved indeed! Many thanks for thinking of me. I am honored. We just love tofu in our family. I am loving this pickled tofu. Would love to try it, very nice job Elin. Thank you so much for the award I feel so honored! thanks Elin for passing me the award. That amount of olive oil is too pricey for me to soak the tofu. But I think it is like those feta cubes in oil, right? Vegan version. you remind me of your salmon post that is also soaked in oil..i want to try that actually..thanks for sharing the award with me, terima kasih!! Pickled tofu? Sounds amazing. I must try this at home too. Btw, have never tried anything like this before. Is it taste like a fermented tofu too? No that bad...just that it is flavorful with the serai, basil and curry leaves in it :) Nice !